I first learned of the original study several years ago when I ran across a piece that appeared at WBUR, Boston’s National Public Radio station: “Medical Professionals Voice Their Feelings In The Abortion Discussion”. It provided invaluable background to the essays and excerpts from the residents. We glean fascinating insights from young doctors, and especially how they wrestled their consciences into submission. But to fully understand the responses, you have to understand the background. 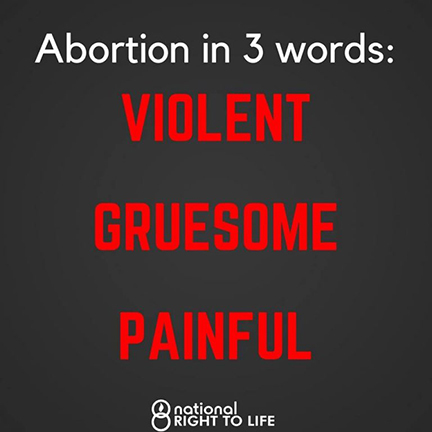 came to me overwhelmed on a day when she had done a late-term abortion and then been called to an emergency C-section for a fetus/baby just a week further along. She needed to talk about how overwhelming it felt to try to decide where the cusp of life was, why it was OK to take one fetus/baby out of the womb so it wouldn’t live and one out so it might. Ah, yes, that would be overwhelming! What do we come away from these essays? First and foremost, the still small voice that we all possess screamed out as they sliced and diced huge babies. So how did they still that voice? Here are some examples of refusing to heed what you know is right (and wrong). If the “acquired knowledge” didn’t to the trick, what did help him or her “fully define” their position? “Feto-centric.” Uh, oh. We know where this is headed. In spite being “taught” his view of the unborn was “feto-centric,” the resident went back to the first principle of medicine: first do no harm. He or she had an experience with a woman with severe preeclampsia at 20 weeks and they had to fly someone in to “perform an abortion at this gestational age.” As they thought about abortion, the resident understandably thought about that woman – but evidently not the baby who by this time was mature enough to be pain-sensitive. Now, all the alarms have gone off and the warning is clear. But he or she gets by that, nonetheless. Partly by hearing that other residents also have serious qualms. Oddly, rather than reinforcing their own doubts, this makes it easier for the resident to go forward. The final step is when the individual is at the clinic and “I soon realized how powerful it was to be able to comfort and assure such vulnerable patients. I began to frame my interventions at the clinic as life-changing for women.” (Emphasis added). By excluding any consideration that there might be a second patient; by limiting vulnerability to the mother, to the exclusion of the unborn baby about to be torn to pieces; and by [re]framing the moral equation to turn a death experience into a “life-changing” experience for women, the resident has “convinced” himself or herself that what they know is wrong is right. I will refrain from talking about any of a dozen parallels and resist the temptation to apply that logic to any other category of dependent people. It is enough to say that if someone feels in the pit of their stomach that what they are doing is violating a moral imperative, they ought not draw the bizarre conclusion that this is “normal” – and thus to be ignored – particularly if many people have exactly the same sense of deep revulsion.